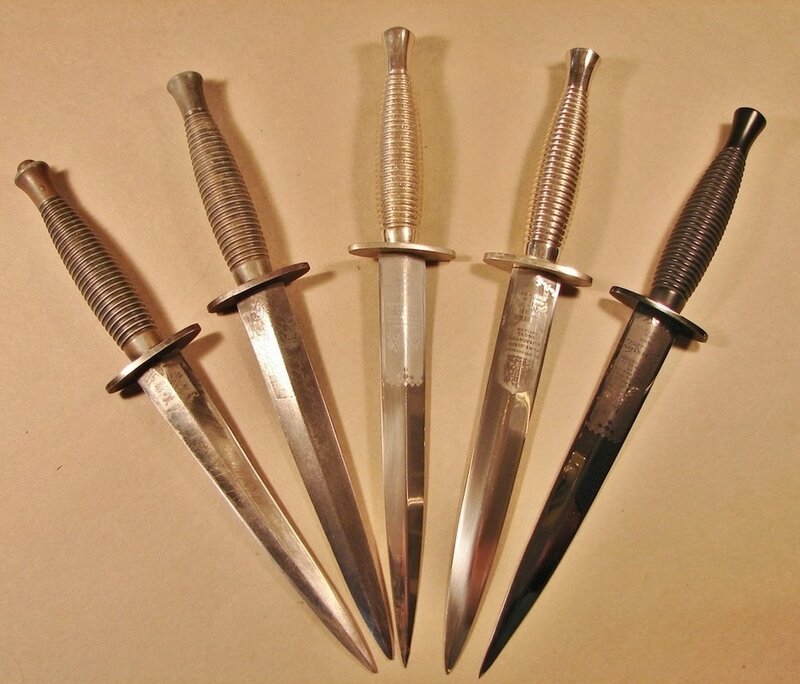 In this section we will look at some of the nickle plated third pattern knives in our collection. 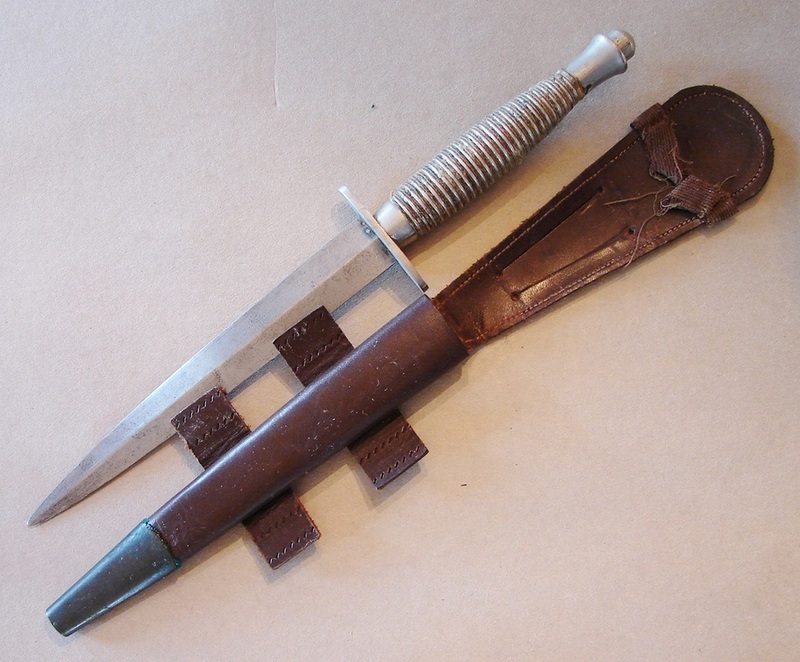 It is often very difficult to determine whether a third pattern knife is actual wartime or post war manufacture. 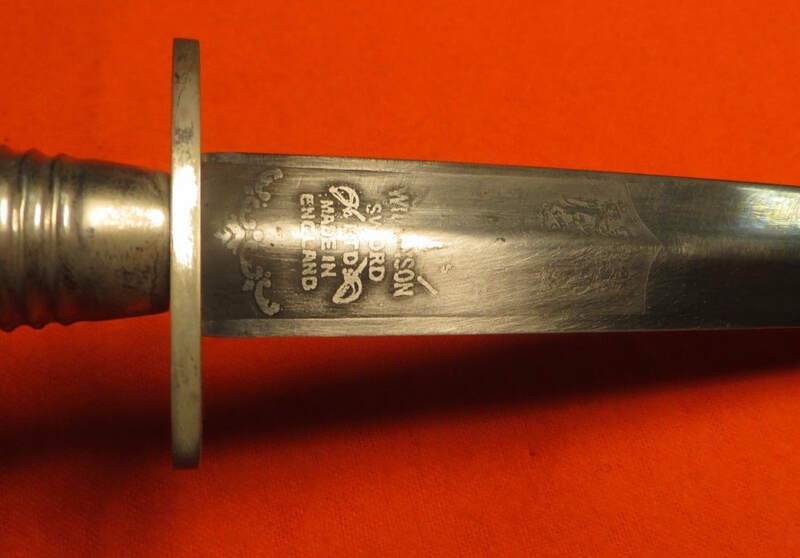 Since the production of these knives was in the hundreds of thousands, and supplies at war's end out-paced demands, many of these knives may have been intended as issue items but as over-runs they were nickle plated to make them more eye appealing and boost sales to private citizens. This is just my opinion. Below: This is a very nice example of a Nickle-plated Third Pattern, probably from the 1950s. It is a Wilkinson Sword with heavy blade and exhibits quality workmanship. Somewhat of a mystery is the condition of the etched logo. You will see the center section of the logo has been very carefully "erased." The lion and unicorn are at the top and the Wilkins logo is at the bottom. In the middle it used to say: "By appointment to Her Majesty the Queen." See for comparison the knife in the photo second from the bottom of this page. Evidently the owner was not a loyal fan of the Queen. The blade has also been carefully sharpened leading me to believe it was carried. Maybe someone in the IRA owned it and had a dislike of the Queen? Many of these knives are unmarked as to their maker. Quite often the only mark that determines a probable wartime manufacture is the mold number on the handle. Post war models usually have had that number polished off, or maybe they came from a completely different mold. I do not know the answer to that at this time. 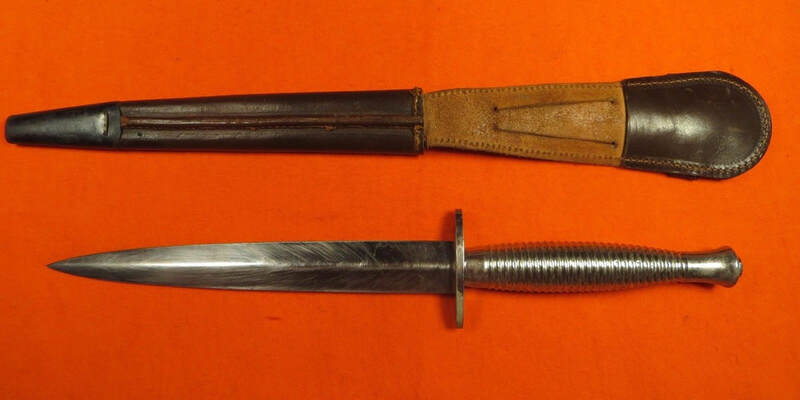 The knife illustrated below has possible links to maritime use, ie Navy or SBS, Small Boat Service. The reason I say that is the handle has been wrapped very neatly and tightly with a fine cordage. This is typical of the knot work mariners do. 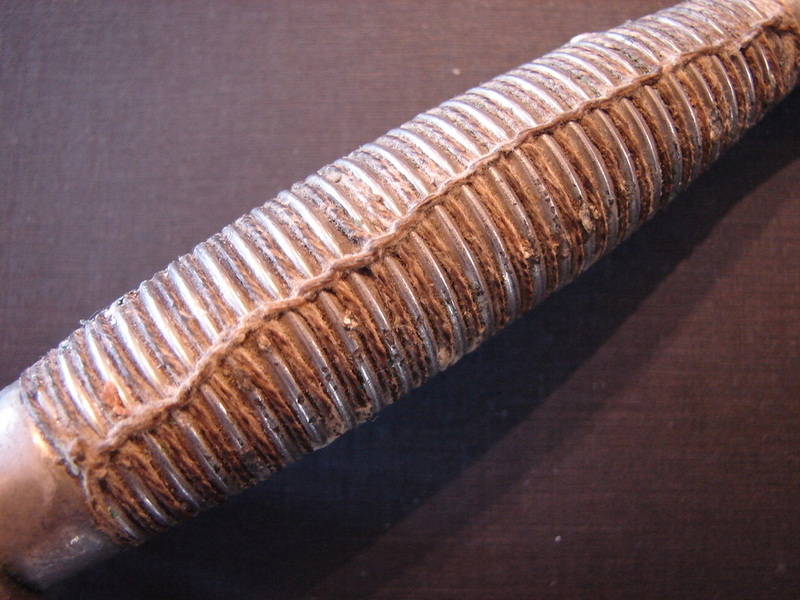 It provided the knife with a much firmer grip by filling in the grooves between the ribs. 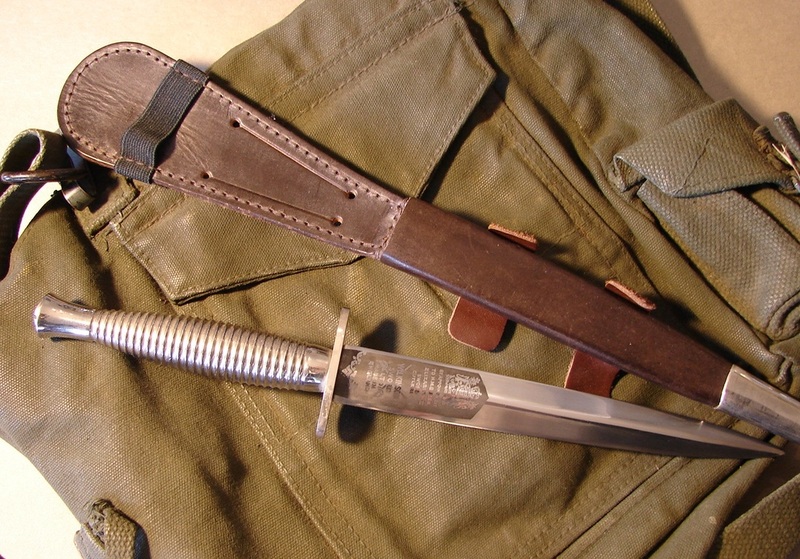 This knife also exhibits wear typical of a knife that was carried, while the knife in the opposite column looks to have seen very little carry or use. The blade of this knife has been sharpened, which is actually quite unusual. Wm. Fairbairn admonished the troops to keep their knives razor sharp but typical of military procurement, they seemed to ignore the fact that to do that one needs a sharpening stone of some sort. Gerber and Randall Made knives corrected this problem by adding a pocket to their sheaths to hold a sharpening stone or steel. Shown below is a full length image of this nice Third Pattern knife. 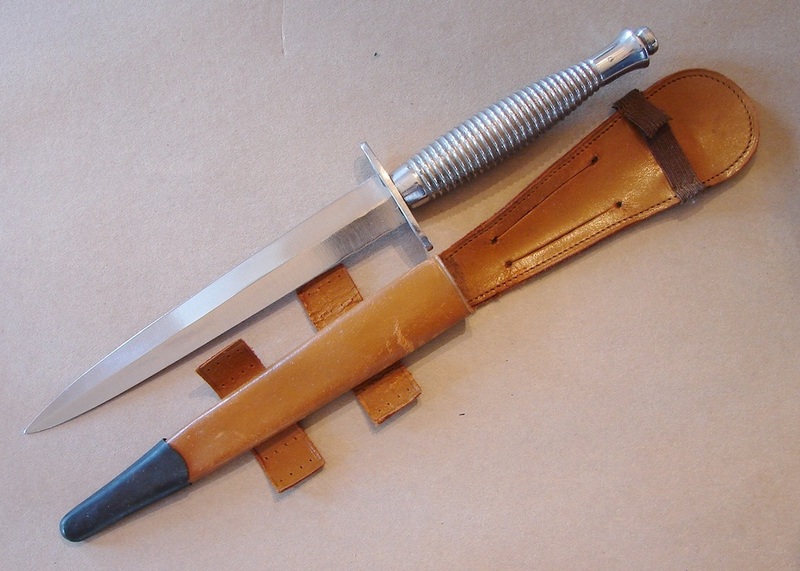 Below: This is not a WW-II vintage knife, perhaps 1950s or 60s. The date indicators are the recessed top nut and the elongated Wilkinson logo. Also you will not find a F-S etch on the reverse side of the blade. Still, it was such a lovely knife I decided to put a photo of it here. These were some of the last of the hi-quality Wilkinson Sword Co. knives. Another photo of some heavy bladed Wilkinson Third Pattern knives. The one on the far left is WW-II. The one next to it may be 1950s or WW-II and the two on the right are post 1960s.